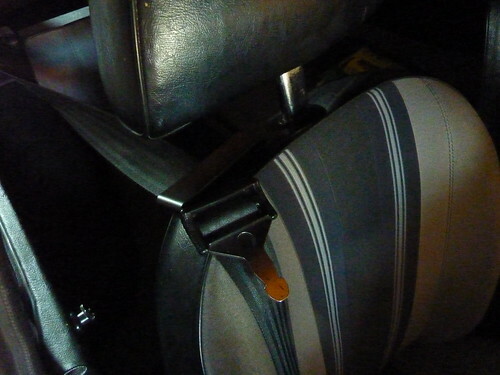 The MGB GT's seat belts are anchored behind the back seat. That means that when you take a seat belt off it has a tendency to fall behind the front seats, ending up with you scrambling around for it when you get back in. To solve this the B's designers put a little hook on the pillar but this is often hard to tag with the belt and means you still have to twist to pick it up. Luckily the fine folks over at PJM Motors have a solution (currently in their new products section) - a metal extension which attaches to the headrest stem and neatly holds the seat belt within easy reach. They're available in either chrome or black powdercoat finish, I went for the black as that best matched my interior and makes them stand out less. Fitting them is very easy, you simply remove your headrests - I say simply but my driver's headrest took a fair bit of convincing to come out as the sprung clip at the bottom was pretty stubborn. With the headrests off you give the stem a quick spray of polish to help ease the clip on - a tight circular grommet ensures no lateral movement - and reinsert back into the seats. The guides are handed, being slightly angled for a good fit, and a good diagram was included to make sure you get them right. I'll be giving them a thorough test this weekend, but I'm initially very happy with how they sit and look.